The best-selling mid-size three-row crossover debuts at New York in its fourth iteration. To say that the Highlander is an important model for Toyota would be an understatement as huge as the vehicle's interior. Last year the Japanese automaker sold nearly a quarter-million of them in the United States, making it the perennial top seller in its segment since 2016. This despite its age, the current model having been introduced what now seems like an eternity ago, way back in 2013. But Toyota has rolled out an all-new model today at the 2019 New York Auto Show that stands to make the big crossover an even bigger player. 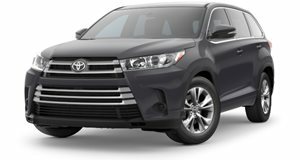 Completely redesigned and now entering its fourth generation, the 2020 Toyota Highlander is more stylish, economical, and technologically advanced than the model it replaces. Though positioned as a mid-size crossover, the new Highlander has room for up to eight passengers on board. But the new model makes them even more comfortable, thanks in no small part to an overall length that's grown by 2.36 inches. The seat padding has been made softer, the cabin made quieter with improved aerodynamics and sound-deadening materials, and the interior space has been made more flexible, too. The second row of seats can also be moved further up to offer more legroom for the third row, and there's more cargo space: 16.1 cubic feet with all three rows in place, 40.6 with the third row folded, and 73.3 with the second row folded as well. Three-zone climate control keeps everyone comfortable. An 8-inch touchscreen display can be upgraded to 12.3 inches (the largest in its segment) – and either way, works with Apple Car Play, Android Auto, Amazon Alexa, Waze, SiriusXM, and on-board Wi-Fi. There's an optional 1,200-watt JBL sound system as well as available ambient lighting and Qi wireless charging. As you might expect, the new Highlander also offers a full array of driver-assistance and safety systems, including pre-collision, pedestrian detection, dynamic radar cruise control, lane-departure assist, automatic high beams, and new lane-tracing and road-sign assist systems. It's all enveloped in fresh, bolder, more "chiseled” sheetmetal that makes it look more like a larger version of the recently replaced RAV4. And based as it is on the new TNGA-K version of the Toyota New Global Architecture, it promises to handle its larger form with better poise on the road, with a stiffer structure and smaller turning circle despite its extended length. Buyers will be able to choose between five trim levels (L, LE, XLE, Limited, and Platinum), eight exterior colors (including three carryovers and five new ones), and two engine options. Gone is the 2.7-liter four-cylinder option and its six-speed automatic transmission, while the 3.5-liter V6 carries over with the same 295 horsepower and 263 lb-ft of torque, mated to an eight-speed automatic transmission and driving either the front wheels or all four. The hybrid option replaces the 3.5-liter V6 with a 2.5-liter four paired with two electric motors to deliver a combined 240 hp. That's a fair bit less than the 306 hp offered by the previous model, but the 2020 Toyota Highlander Hybrid is projected to return 17% better fuel economy, estimated at 34 miles per gallon on the EPA's combined cycle, and it will now be available with all-wheel drive, too. Following its debut at the New York Auto Show this week, the 2020 Toyota Highlander is set to begin reaching dealers this winter: December 2019 for the conventional gasoline model, and February 2020 for the hybrid. 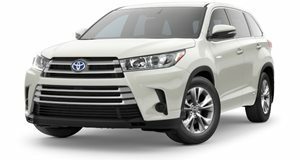 If you’re in the market for a family SUV, the Toyota Highlander should be near the top of your shopping list. Can the Highlander continue to be a compelling minivan alternative?